ESPN’s Adam Schefter reports that the Cleveland Browns have released veteran wide receiver Kenny Britt. Britt will now go on waivers and is expected to go unclaimed. A recent report by ProFootballTalk claims that Britt hopes to sign with a contender by sometime next week. The ninth-year receiver was inked to a four-year $32.5 million-dollar deal in March, but failed to live up to his contract and graded poorly over his nine games. Through 13 weeks of the campaign his PFF overall grade of 45.4 ranks 103rd of 117 qualifying players at the position. This year, Britt played 52.0 percent of the Browns’ offensive snaps, but only saw 35 of the team’s 207 wide receiver targets. To make matters worse, only 23 of those targets were catchable, and he dropped five of those passes, giving him a drop rate of 21.74 percent which currently ranks 86th of 88 wideouts with at least 18 catchable targets. However, there is a good chance he signs with a team down the stretch, as he proved that he could perform at a high level in 2016. 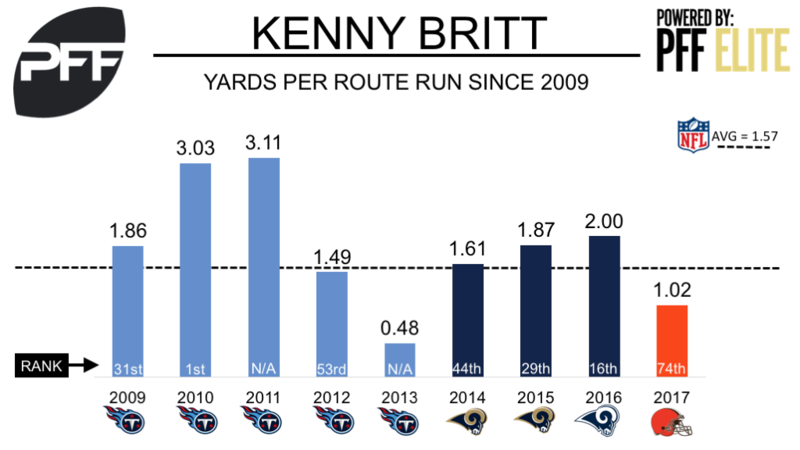 Through 15 games of the 2016 season, Britt caught 68-of-72 catchable targets for 1002 yards, despite underwhelming quarterback play from both Case Keenum and Jared Goff. He ended the 2016 campaign with an average of 2.0 yards per route run, which ranked 16th of 95 receivers with at least 45 targets.